I spent the first 22 years of my life in Texas, but I just recently lost my tolerance for hot weather. We’ve had a “heat wave” in Seattle and I’m hiding in the shade and complaining alongside my other pale Pacific Northwest friends. Some may say that my lack of heat tolerance revokes my Texan card, but I know (and Shae lovingly reminds me) that I’m 100% Texan because of my obsession with air-conditioning. 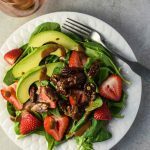 This strawberry spinach salad is my food version of air-conditioning in the summer – refreshing, crisp, and bursting with color and energy.This strawberry spinach salad with balsamic dressing is just delightful. 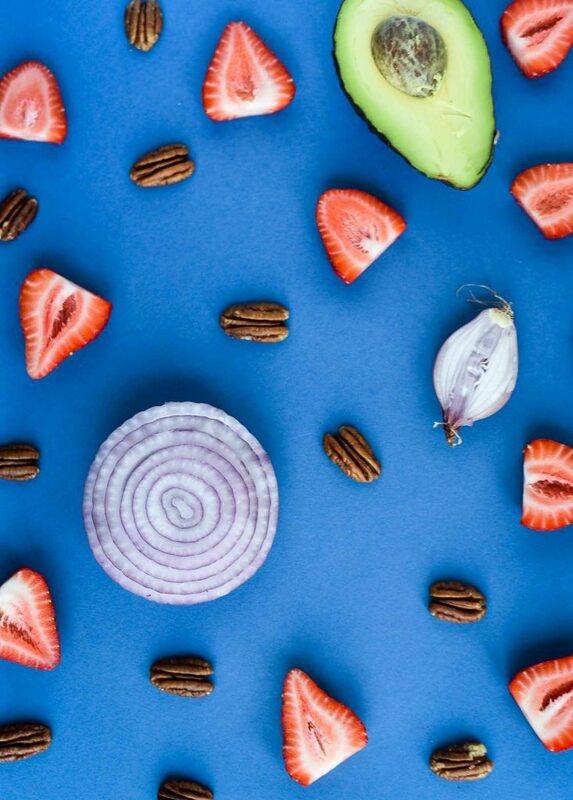 It has candied pecans (cue the pecan pronunciation debate since we’re on the topic of Texas) and a delicious homemade balsamic dressing which brings all the right flavor. 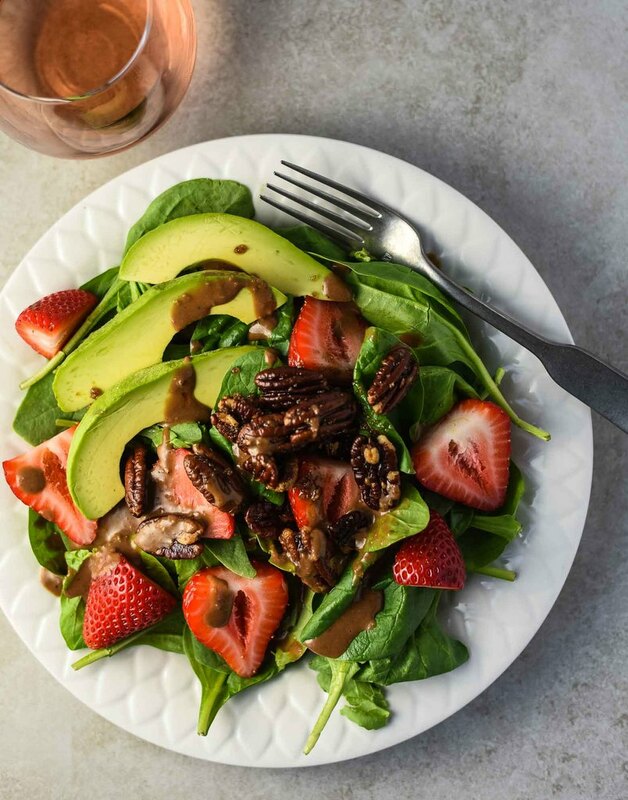 If you make this strawberry spinach salad and drink some wine, let us know how it goes! Leave a comment, rate it, and don’t forget to tag a photo #plantandvine on Instagram. Rosé – Ultimate summer dish achieved by pairing strawberry spinach salad with Rosé. Strawberry, pomegranate and rose petals. Lots of wine experiment possibilities here, depending on the base grape. Suggested Regions: Provence or Languedoc-Roussilon, France (dry Rosé) or Tempranillo / Grenache-based Rosés from Spain for meatier, candied grapefruit flavors. Soave – white wine made from the Garganega grape in Veneto, Italy. Look for young Soaves that are light and zesty with flavors of honeydew melon, white peach, and preserved lemon to balance the balsamic dressing. Bordeaux Blanc – white Bordeaux blend of Sauvignon Blanc and Sémillon. The Sauvignon Blanc brings good acidity to the Sémillon, with lemon, yellow peach, and salty flavors. Suggested Regions: Graves, Bordeaux, France, Hunter Valley, Australia, or Washington state. 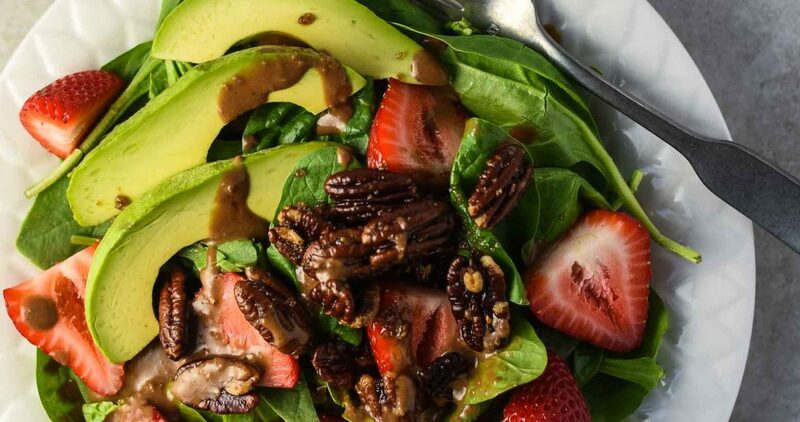 Strawberry spinach salad recipe with homemade candied pecans and balsamic dressing. Perfect summer meal. To make candied pecans, preheat oven to 350F. 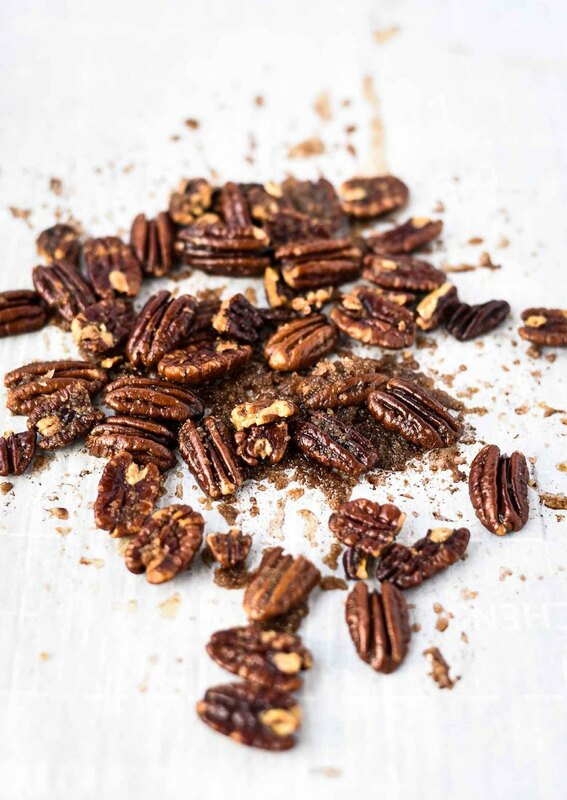 Place pecans on parchment-lined baking sheet. Roast for 8 minutes. While pecans roast, add coconut oil, sugar, sea salt, cinnamon, and cayenne pepper to a small mixing bowl and whisk to combine. Remove toasted pecans from oven and toss in spice mixture. Spread back onto the baking sheet and roast for another 4-7 minutes until fragrant and golden brown. Once fragrant, remove from oven and cool. Toss with more salt or sugar if needed. To make balsamic dressing, heat small saucepan over medium heat, then add 1/2 tablespoon of olive oil and shallot. Sauté until soft, about 3-4 minutes. Remove from heat and set aside. Once cooled, add shallot to small food processor with balsamic vinegar, remaining olive oil, garlic cloves, Dijon mustard, maple syrup and a pinch each of salt and pepper. Blend until completely pureed. Taste and adjust seasonings as needed. To make salad, toss fresh spinach and fresh strawberries in bowl. Plate spinach mixture and top with avocado slices, candied pecans, red onion, and drizzled balsamic dressing. Best when fresh. Store ingredients covered in refrigerator. Keep balsamic dressing separate from ingredients until ready to serve. Thanks, Sue! Let me know if you try it. I always love hearing feedback. Thanks, Sarah. They’re addicting; it was a challenge to not eat them all before the salad was finished! Made this for my wife last night and it was delicious. Loved the wine pairing. I went to our city’s best wine shop who quizzed me on the ingredients. They recommended a white Bourdeaux per your suggestion that originally tasted “meh” but came alive w the salad. I am now only buying wine specifically paired w my dinner choices vs randomly choosing a red or white. Thanks for sharing. I feel as though I just crawled out of a culinary cave! Cindy, your comment made my weekend! So happy to hear you enjoyed both the salad and the wine pairing. I’m excited to hear about your future explorations with food and wine pairings!